Winter, the temperatures are below zero and the snow is over a foot deep, time to get out the spinning wheel and the lovely raw angora fiber I’ve been saving all year. Spinning fiber into yarn is a very relaxing and, for me, therapeutic activity. The clack of the wheel, rhythmic pushing of the foot pedal, and endless adding on of new strands of fiber to the twist of yarn in my hand sends me into a sort of hypnotic trance. I can feel my blood pressure lowering and my stress hormones melting away. 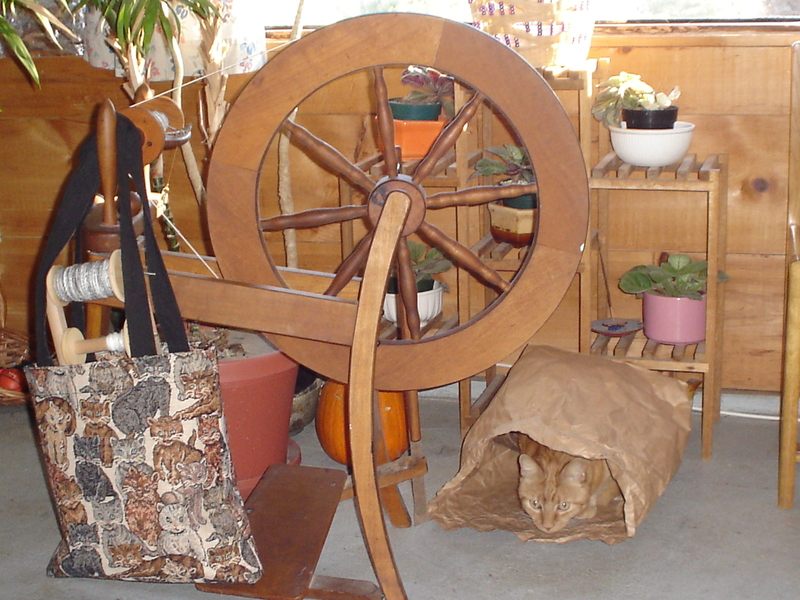 Here’s a shot of my spinning wheel, work bag, some gray fiber loaded on the wheel and my old cat, Rusty, who loved to hide in paper sacks. When I get a chance, I’ll take some more photos of the spinning process and do another post on spinning. Since my mother lives in Kent, in England, I fly over from Boston to visit her at least once a year. My mum doesn’t drive anymore and depends on mass transit or a helpful neighbor to get around. For a little excitement when I visit, we rent a car and I run us around the countryside sightseeing. Three times we’ve been to Rye, a small town in East Sussex, near the coast in southern England. I love this place, so steeped in history and still retaining architecture from ages gone. You enter the town through one of the gates of the old wall, a very narrow opening that limits the size of vehicles in Rye. Pictured above is one of several towers from the old walls. 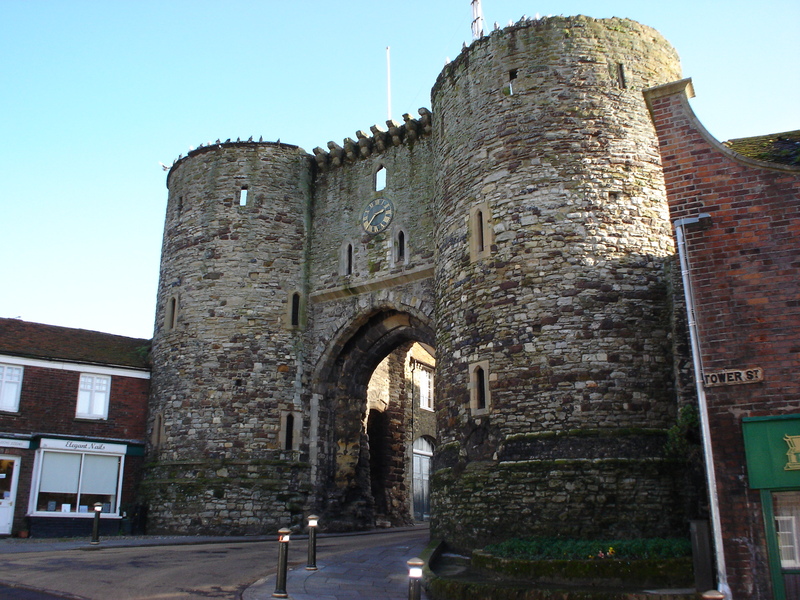 Because Rye was once on the English Channel, it had to be fortified against attack, especially from the French. 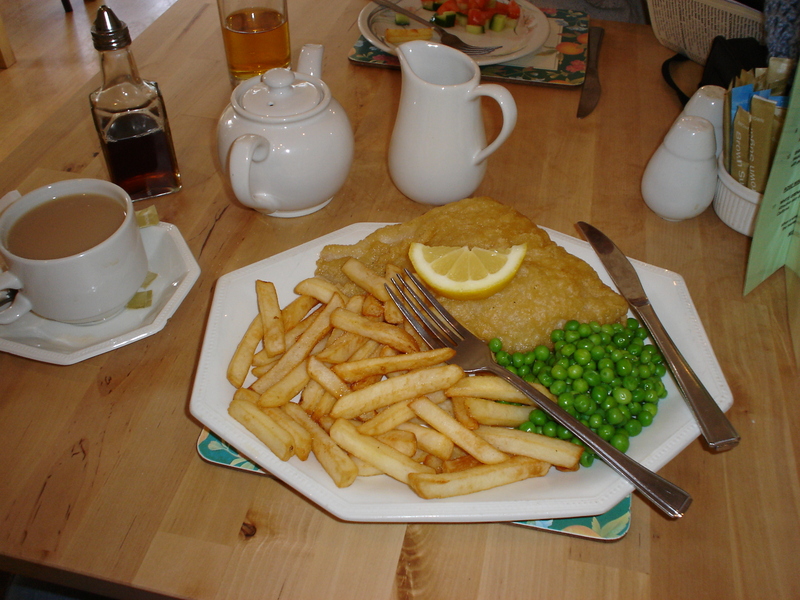 We always eat at a sweet little tea shop called The Runcible Spoon where I have my obligatory fish and chips, always with lemon for the fish and salt and malt vinegar for the chips, and a few nice cups of tea. Thus fortified, my mum and I explore the old city. Located on a chalky hill above the marshland and rivers, the town has stood since before Roman times. Once a sea port in a sheltered harbor, the town is now more than two miles from the Channel. The harbor silted in ages ago. Rye sits at the confluence of three rivers and has a river port now. 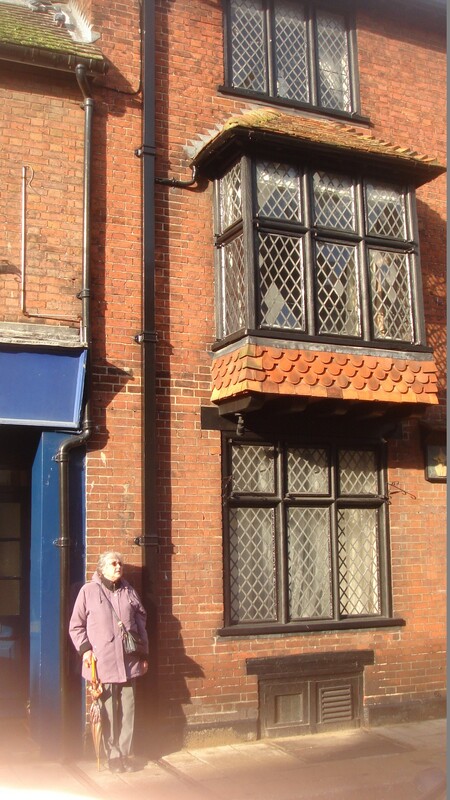 Some of the best very old architecture is on Mermaid Street, including the Mermaid Inn. 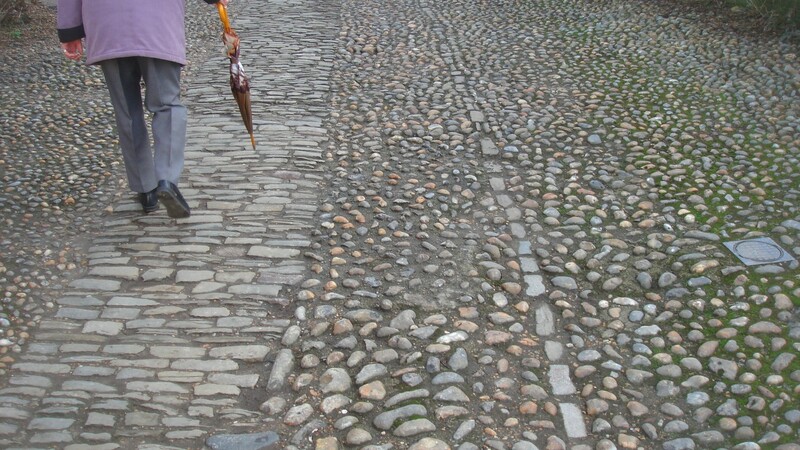 The streets in the old town are mostly cobbled and rather hard walking. Here’s a shot of my mum on the “sidewalk” of the street. 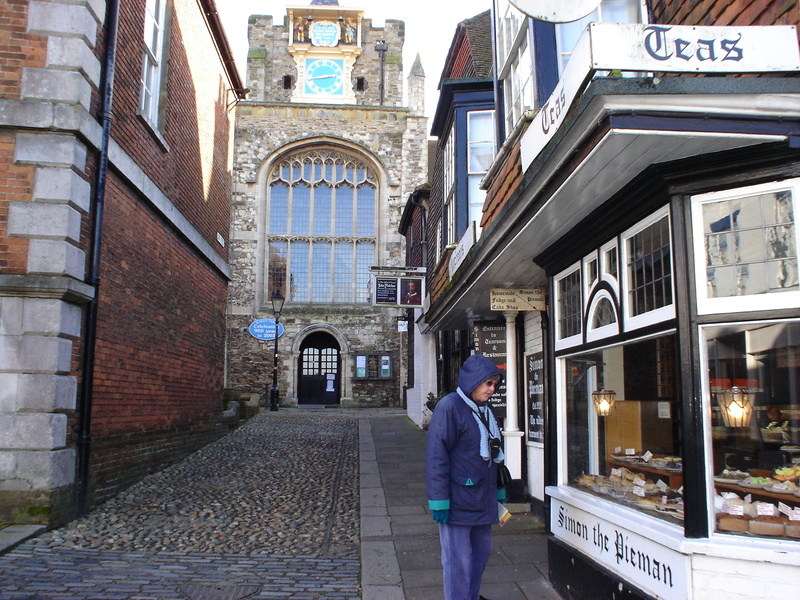 There are many interesting little shops and tea rooms in Rye and once we caught a flea market in one of the church halls where I found a lovely ring and a porcelain box. Here’s my mum checking out a tea shop. She’s an inveterate shopper as is her daughter! 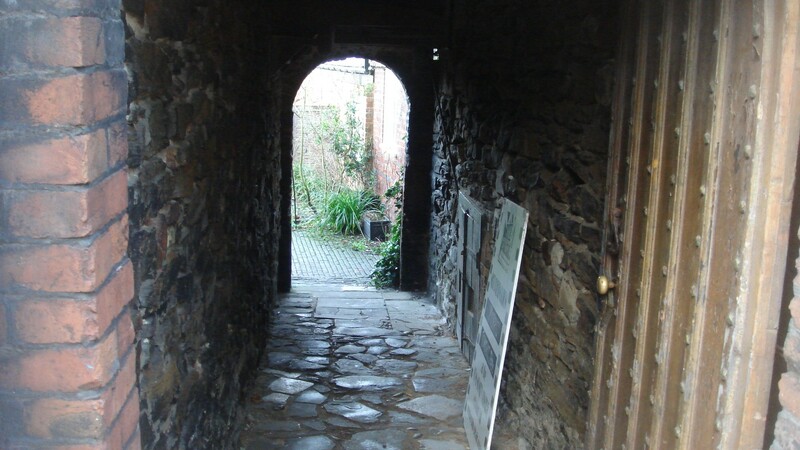 Some buildings have leaded windows or tunnels leading through the buildings to courtyards at the back. The Tudor construction is very evident. 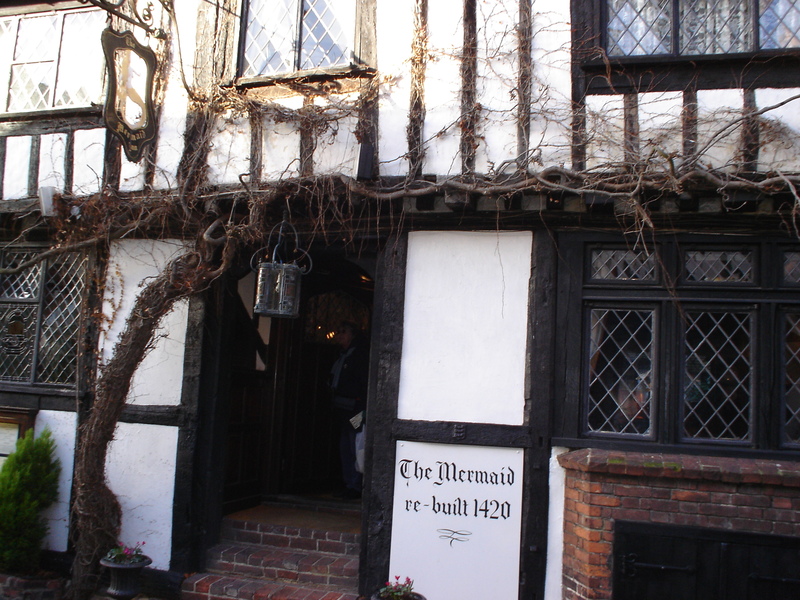 The Mermaid Inn is particularly popular with tourists due to its age. The original building has been attributed to 1156. Today what remains of that building are the cellars. In 1379 the town was sacked and burned by the French and the Mermaid was rebuilt in 1420. Much of that building still stands. The inside has low ceilings, heavy beams and dark woodwork. An ancient vine grows by the front door. This inn is reputedly haunted by several ghosts and has been featured on television programs about famous hauntings. With 31 rooms for lodgers, there are ample places for specters to hide. The inn was used in the 1700s by smugglers, a rough and violent bunch with many untimely deaths among their members. The hauntings are mostly supposed to be of these smugglers. Main entrance of the Mermaid Inn. 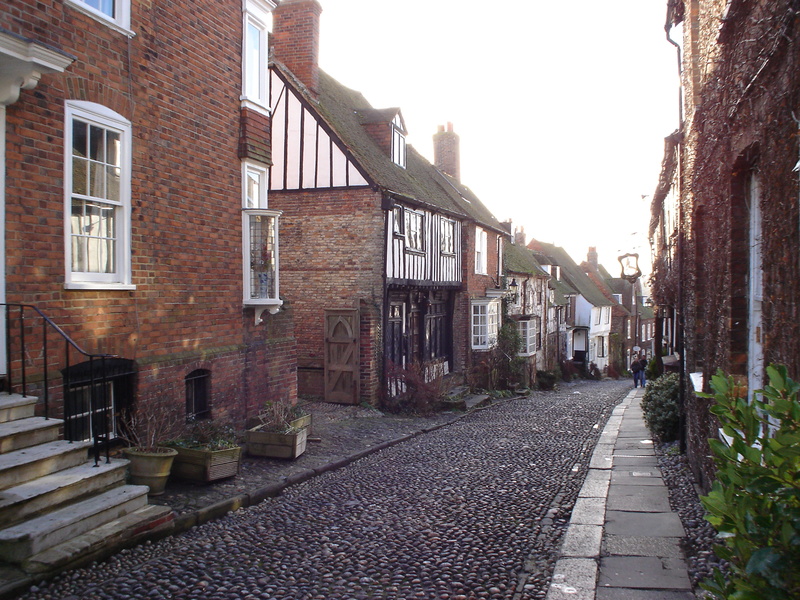 I so enjoy visiting Rye that I wouldn’t mind going again. The situation in a sparsely populated area of narrow roads, farm land, marsh and woods makes for interesting driving. I even got into my only accident of my many years of driving on the “wrong side” of the road while going to Rye. I took my eyes off the road for an instant too long and rubbed up against a guard rail. No lasting damage was done to human or vehicle. I hope to enjoy another memorable meal at the Runcible and further explore the little shops with my mum. Here’s our new tractor, a Christmas gift to ourselves! 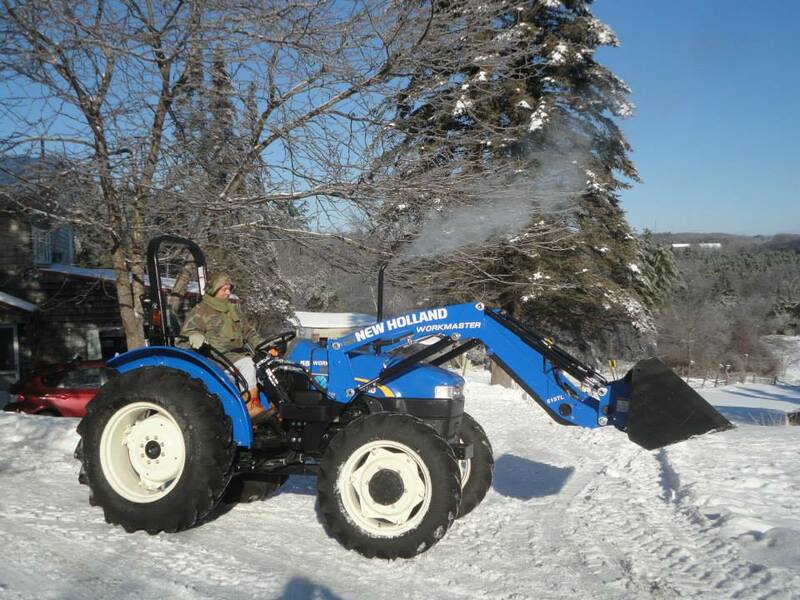 A 2013 New Holland Workmaster 55 4WD with loader. It had 2.3 hours on it when I started running it, so sweet. Replaces a 2WD without a loader. Finally, I can do some real tractor work. Here I am learning to use the loader by clearing the driveway on Christmas Day. 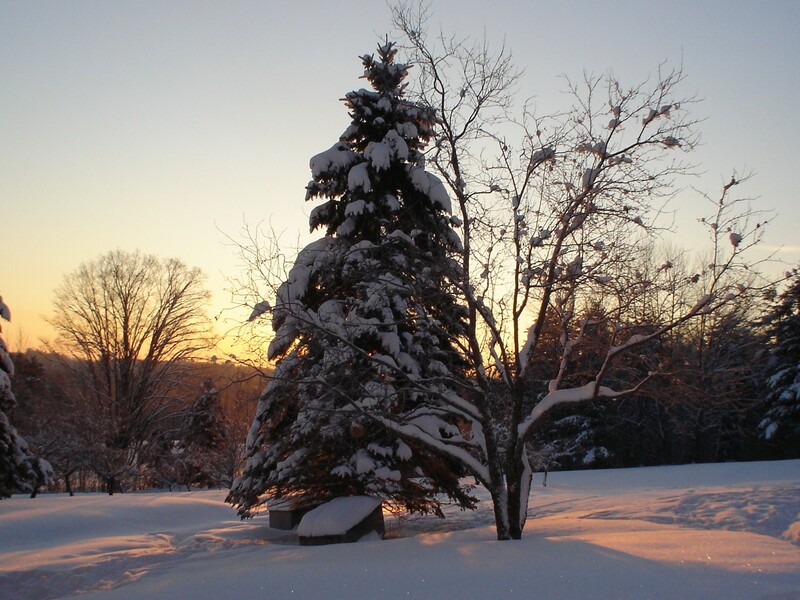 This entry was posted on December 27, 2013, in Family, Farming, Musings, Uncategorized. 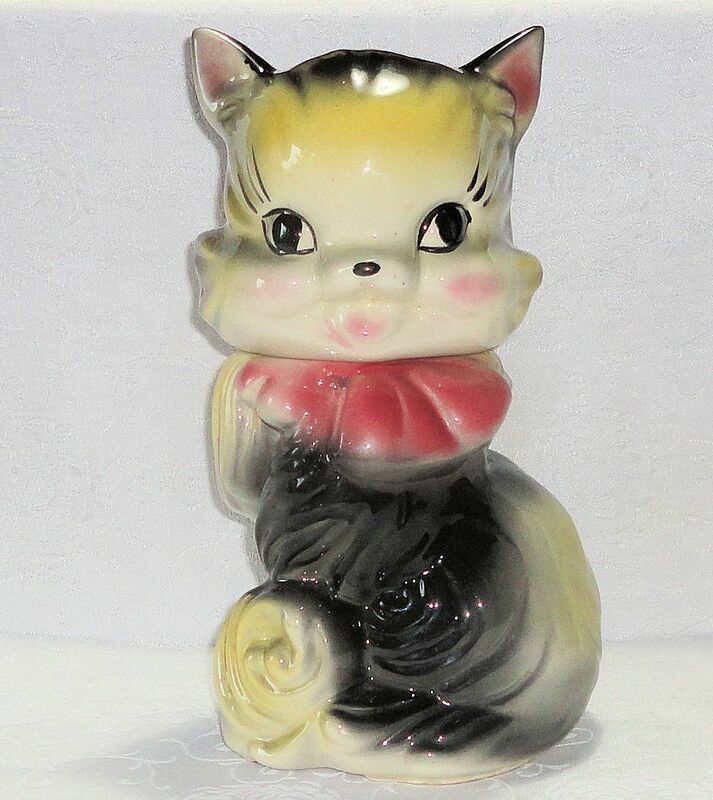 At the thrift shop the other day I found this vintage cookie jar in the shape of a cat. It was not marked in any way and the price of $22 was a bit of a gamble since I like to at least double what I pay for an item when I sell it. The condition was excellent, no cracks, no chips in the paint, no major crazing. I knew that old cookie jars were popular so I took the risk and bought it. Research led me to the American Bisque Company. 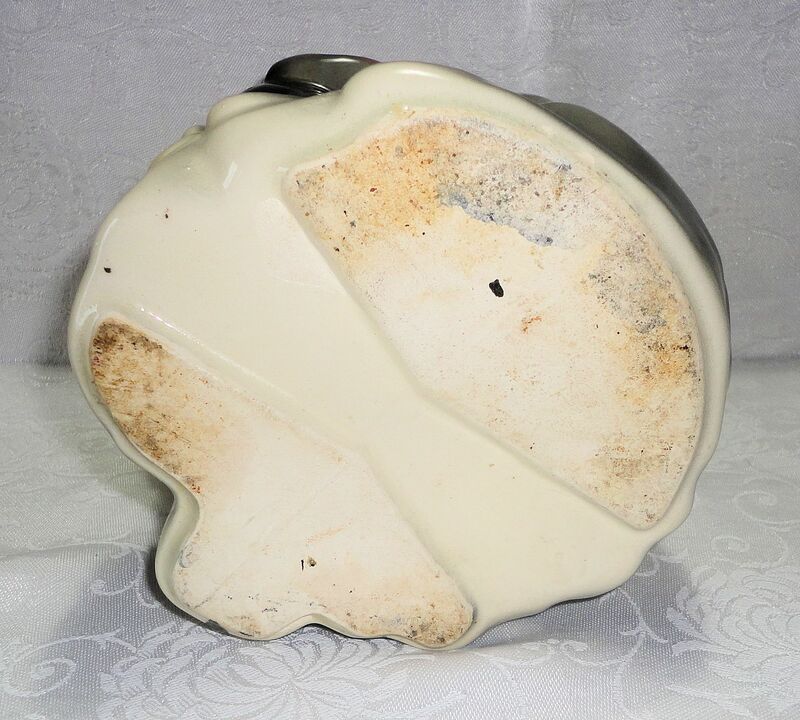 The jar has the wedge shaped footing that is typical for that company. 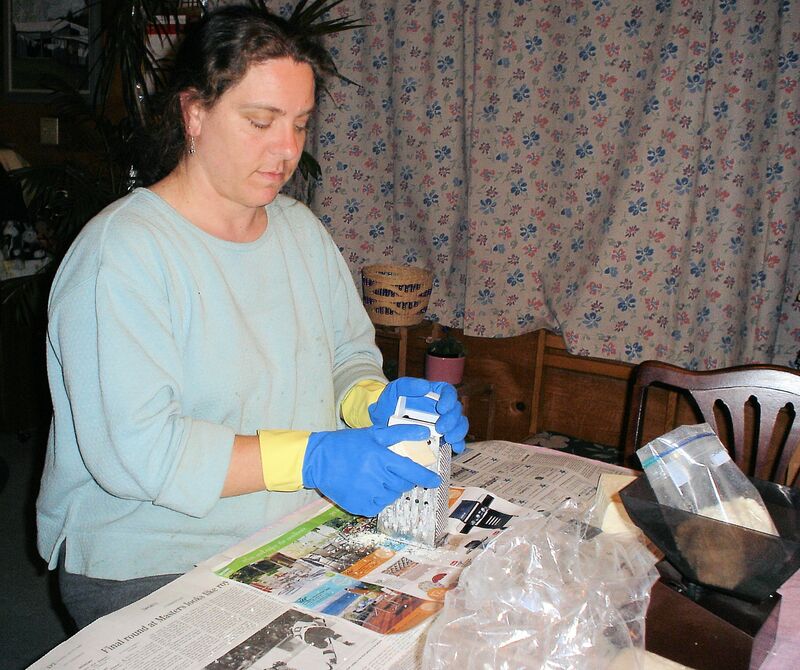 There were several jars in the same shape, except they were 1.5″ taller and most were solid color with cold paint. My jar was air brushed under the glaze. I know that knock offs are usually smaller than the original because the item being reproduced is used as the mold for the counterfeit. I could find no good information about the jar online. So, I searched for books and found American Bisque, A Collector’s Guide by Mary Jane Giacomini. It was not available to view online and to buy one would cost at least $25. So I searched Inter-Library Loan and found the closest copies were in NY and VA. I put in a request at the my local library and a week later the book arrived from VA. There was the cookie jar pictured on page 98. 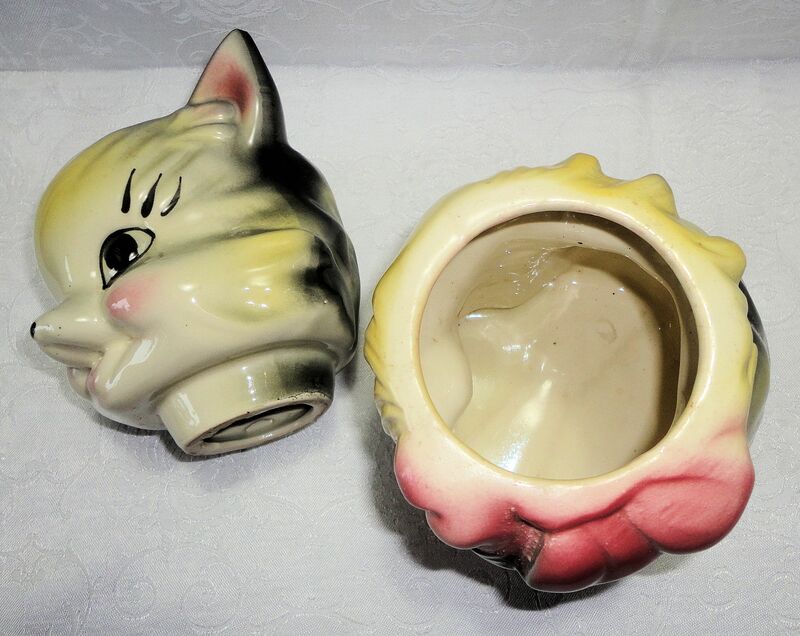 The author said that American Bisque started making cookie jars in the late 1930s. At first they were larger but the size was reduced when the company switched from boxing and shipping each item separately to placing several pieces in one big box. To make them all fit, the cookie jars were shrunken a little. The answer to the size difference. There was no indication of when this change occurred, so the age of this jar is hard to determine. The company went out of business in the early 1980s. 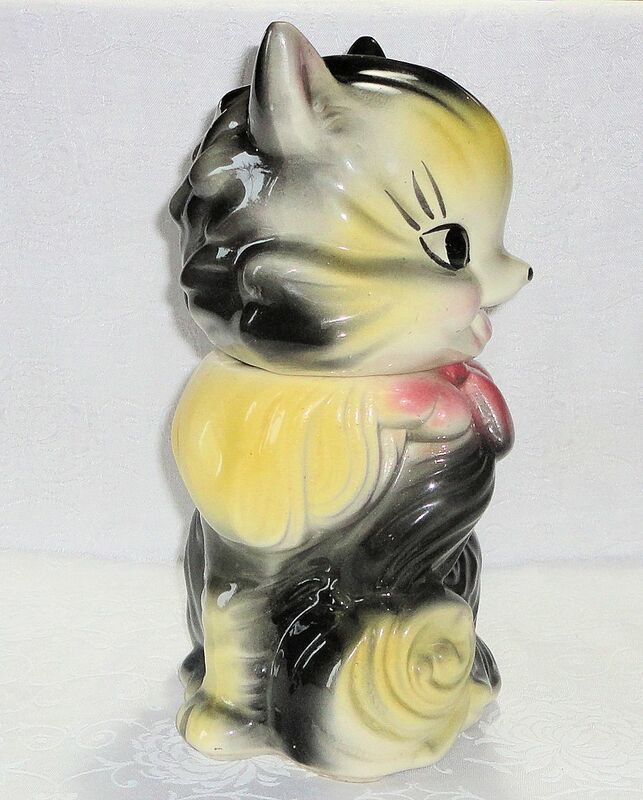 Hundreds of these jars were probably produced, but the air brushed version appears to be more rare. There are very few offered for sale online. Currently one is listed on eBay for $200 with free shipping. Another is on TIAS for $150. The only problems I can find with my cookie jar are an area inside the rim of the head that appears to have split some during production and chipped in that area after. A small spot on one hip has a rubbed area in the paint that looks like it occurred before firing. Inside on the bottom are a couple thin craze lines. Very minor issues for this sort of ware. The jar is listed on auction in my eBay store for $90. I hope to get a taker. If there were more room in my display cabinet, I’d keep this little jar because the cat is adorable. I must have sensitive skin because I hate to use regular soap. Even the commercial stuff that’s advertised as mostly lotion, or the bars called glycerine soap, leave my skin feeling dry and stretched after bathing. The only soap I’ve found that I can tolerate is made with goat milk. My skin never feels too tight for my body after a shower with goat milk soap. Very quickly I discovered that goat milk soap is expensive to buy. I have a friend who keeps a small herd of goats and always has a few extra gallons of milk so I decided to try my hand at making my own soap. 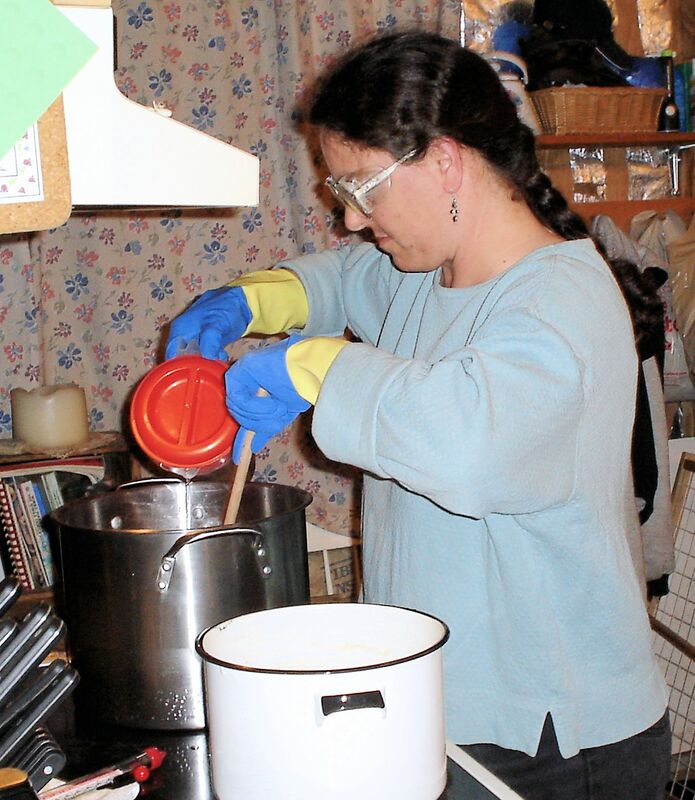 Soap making turns out to be an involved process that is even dangerous. 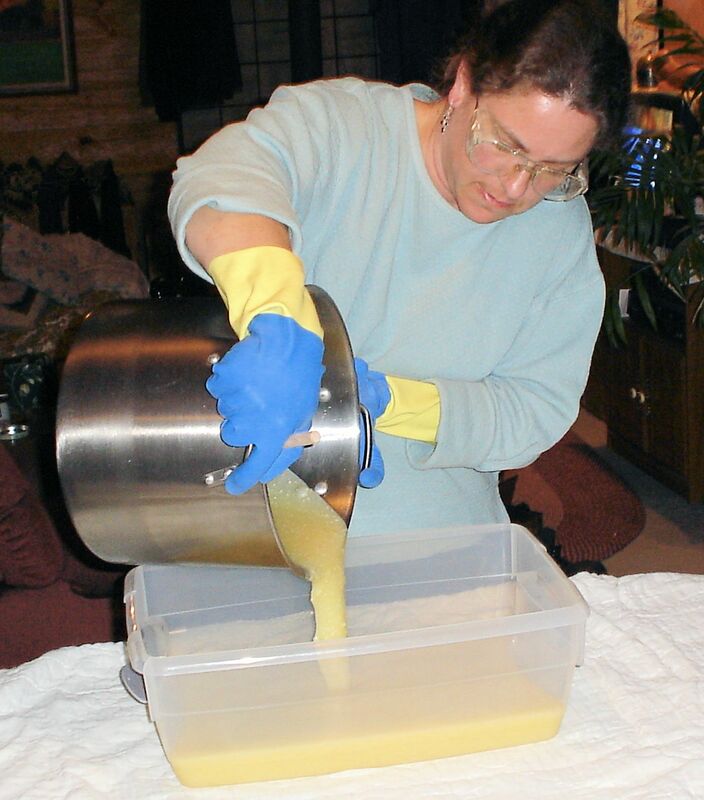 To make soap, caustic lye must be combined with fat. There is no other way to obtain real soap. Pure lye was once readily available in hardware and grocery stores and was used to unstop clogged drains. The pH of lye is very high and if it touches your skin, eyes or mucous membranes it can cause very severe burns. In recent years, the drug cookers who use lye to make methamphetamine have caused pure lye to be a difficult commodity to obtain. No longer can you just buy it off the shelf. But, it is available for us inveterate soap makers from soap supply companies. 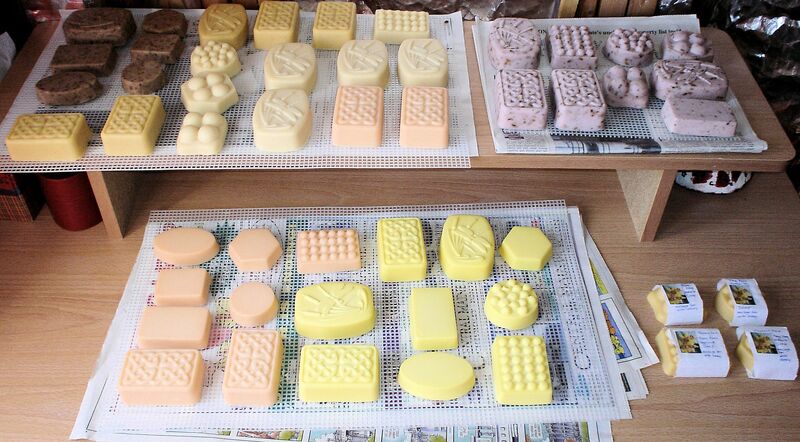 There are different sorts of soaps that can be made. There is a choice of hot or cold process. I prefer hot process which involves melting the fat and combining it with liquid lye at a temperature of about 100-125 degrees Fahrenheit. The fat and lye must be the same temperature so they blend properly. Here I wear protective goggles and gloves as I mix the lye with the fat. There are a wide range of fat choices available and the characteristics of each fat must be considered based upon the sort of soap desired. I want a very moisturizing bar with good lathering and cleansing qualities that is fairly hard so it won’t melt in the soap dish. To accomplish this I must choose fats based upon their saponification values or how much lye is required to produce soap and on their fatty acid content and iodine levels. Various fatty acids provide different characteristics to soap. Some give more lather, some less, or more moisturizing or conditioning or hardness or softness. Iodine levels help determine the hardness of a bar of soap, higher levels make softer soap with better conditioning. Over time I have developed my own recipe that includes mostly olive oil, with palm kernel, sweet almond, avocado, and castor oils and cocoa, shea and mango butter. All these must be meticulously measured by weight and combined by melting over low heat until they reach the desired temperature. The powdered lye, also measured by weight, is carefully and slowly combined with the correct amount of cold water, stirring constantly. I make my lye solution outdoors in a large plastic pitcher with a stainless steel spoon, wearing gloves and goggles. The reaction of the lye and water causes rapid and even violent heating and can become a caustic eruption if the materials are combined too quickly. The fumes produced are very caustic and not to be breathed. The hot solution is over 200 degrees when first combined and must cool to the same temperature as the fat. When this is achieved, the lye is slowly poured into the fat. Immediately, the fat begins to turn to soap. Some people prefer to add the goat milk at this stage by using slushy-frozen milk instead of water to make the lye solution. I think this is too hard on the milk and defeats the purpose of creating a truly moisturizing soap. I save the milk for adding later. With an electric stick stirrer, I whip together the fat and lye in a large stainless steel pot until it reaches the consistency of thick pudding. This whipping must not be done too quickly or the fat is not properly saponified and can separate from the lye during curing. Here I pour out the newly made soap in a large form that can be covered so the soap can rest and cure. The soap I make is a choice variation. Many people stop at this first or basic stage of soap making, let the stuff cure then cut it into bars for use. At this point, decorative elements found in basic stage soap are added: small, colorful soap bits, shaved soaps, swirls of color, or the fragrance. I make a two stage or milled soap. For milled soap, the basic stage is allowed to set, all wrapped in a blanket so it doesn’t chill too fast, for 24 hours. Until it is properly cured, basic soap is still very caustic and can cause burns. Even after curing, basic soap is far too strong for my precious and particular skin. The high glycerine content achieved with hot process soap still is not enough moisturizing for me. Basic soap dries my skin. To mill the soap, I let the large block that has been curing sit uncovered for a couple days to dry and firm up. Then I cut the block into manageable pieces and shred them like mozzarella cheese. At first I used the hand cheese grater but have since gone to a Moulie hand turned grater. 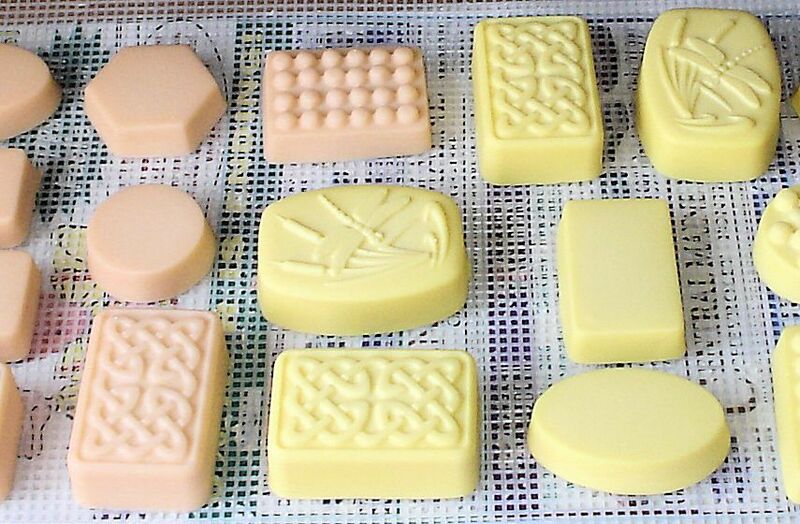 The chunks of soap are inserted into the grater, the soap is pressed against a round blade in the machine that is turned by hand and the gratings fall out the bottom. Moulie graters were once very popular and used to make coleslaw or to julienne vegetables. Now-a-days people use food processors and salad shooters and such for grating but I love my Moulies and have purchased two off eBay for soap making. The shredded soap is weighed. Each recipe of milled soap I make requires 12 ounces of soap and 9 ounces of goat milk. These are combined in a double boiler on the stove and the soap is remelted over the hot water and stirred until it combines with the goat milk. People might think goat milk soap has a bad odor, not true. Properly made unfragranced soap has a clean, fresh scent all its own. At this melted stage, any desired color, extra ingredients like pumice or lavender buds, and fragrance are added. I use only food grade color and pure essential oils. Some of my favorite scents are sandalwood ylang ylang, cedarwood sage, mango papaya, lemongrass sage, lavender, apricot, carnation and rose. The remelted soap is poured into bar-sized molds or a larger mold to be cut later into bars. I place the soap in the molds in the freezer for 24 hours. My freezer is a self-defrosting model so it draws water from the soap overnight, helping to dry it enough so it pulls away from the edges of the molds. The next day I work the bars from the molds and place the newly made soap on large sheets of plastic canvas lined with newspaper for drying. The bars must be turned daily during the first few days so they dry on both sides and don’t stick to the plastic canvas. The best environment is dry and cool. During the hot, humid summer months soap takes much longer to dry. Drying soap bars. Scents include vanilla, sandalwood, apricot and lemon. Also shown are oatmeal bars and lavender with lavender buds incorporated. At lower right, bars with paper wrappers. After a few weeks, the bars are dried enough so they can’t be indented by pressing their middles. Now they can be wrapped in paper and stored for use or sold if one wishes to recoup some of the costs of making the soap. I used to sell a lot of soap but find the competition too daunting. Now I save all my soap for the family and never use anything else for my skin. Hand made soap makes a lovely gift as well, always welcomed by my friends. The sunrise over one of our orchards and the dog houses at the winter solstice time of the year. The long light angles of a faraway sun cast a reddish glow across the deep snow. What we celebrate this time of year is much older than the birth of Christianity. The need to mark the solstice is locked in our primal psyches by the hundreds of thousands of years our species has spent in the higher latitudes where light disappears as the days shorten in winter. The long, cold nights were once filled with hungry predators happy to put human on the menu. The sun with its life-giving warmth pulled away, leaving withered and leafless plants and endless ice and frost. A frightening time when the best humans could do was look to the future and hope for the swift return of the sun. Evidence exists that mankind made tools to gauge this shortest day of the year so all could breathe a sigh of relief. The worst was at it’s peak, the sun and its warmth would now start the return. Is that not something to celebrate? Cardinals are beautiful birds, welcome at my feeders in any season. I prefer to see them in the warm months, especially the pair who call our farm home. In the spring they busily gather material to build their nest. The female is very territorial. One year she saw her refection in the side view mirror of our car and spent much time attacking it before I turned the mirror in so she was no longer threatened by the other female. The male fills the area with his calls all through the warm part of the year. Seeing these birds in winter at the feeder is ominous. For the past few years, they have become permanent residents. The pair visit for their share of safflower seeds every winter day and I believe there is also a single male that comes around. 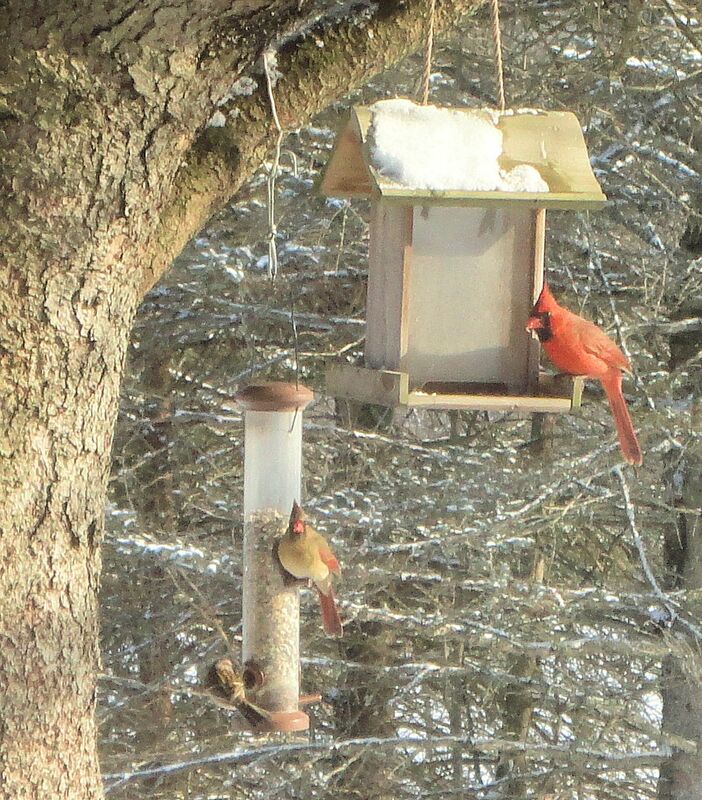 Growing up here in northern central Maine, I never saw cardinals in the snow. They did not overwinter so far north. It was too cold. All that has changed. With our lowest temperature last winter only about 15 degrees below zero Fahrenheit, this part of Maine has warmed considerably since my youth. I remember nights of 30 below or less. These bitter temperatures have not occurred for us in several decades. The wondrous governor of our state, Paul LePage, that caricature of the faux pas, whose habitual stance is with foot in mouth, has recently stated that global warming is good for Maine. It has opened a northern shipping passage around the Arctic Circle that will allow many more ships to use our ports, thus enriching our coffers. With global warming comes a rise in sea level. How does this mental giant leading our state think Maine will succeed once our major ports are flooded by a foot or more of sea water? Or the countryside inundated for miles inland as the river water levels are forced higher by a rising sea? I pity the next generations, for we do so little to stop the oncoming disaster while we still have time. They will not thank us for our failures just as we are not grateful to our forebears for polluting the environment with chemicals. The clean up costs for the lack of foresight fall to us as surely as the consequences of a rising sea level will overwhelm our children.